Artist's impression of the European Extremely Large Telescope (E-ELT). A European project to build the largest optical telescope on Earth took a big step closer to becoming reality Monday (June 11), when final approval came from the scientific consortium backing the new observatory. Plans for the mega-telescope, appropriately called the European Extremely Large Telescope (E-ELT), were approved by the governing council of the European Southern Observatory (ESO), officials announced Monday. "This is an excellent outcome and a great day for ESO," ESO Director General Tim de Zeeuw said in a statement. "We can now move forward on schedule with this giant project." 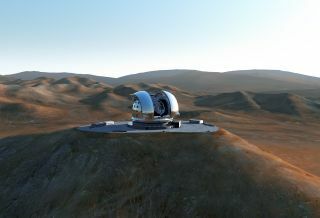 The E-ELT will be a 129-foot (39-meter) segmented-mirror telescope sited atop a mountain called Cerro Armazones in northern Chile, close to ESO’s Paranal Observatory. It will be many times more sensitive than any other instrument of its kind, researchers said. The huge telescope will collect at least 12 times more light than today's largest optical telescopes, allowing astronomers to probe a variety of high-priority cosmic questions. Scientists will use it to help search for habitable alien planets, for example, and to study the nature and distribution of dark matter and dark energy, the mysterious stuff thought to make up most of our universe but which astronomers have yet to detect directly. "The telescope is set to revolutionize optical and infrared astronomy," said Isobel Hook of the University of Oxford, the United Kingdom's E-ELT project scientist, in a statement. "Its unique combination of sharp imaging and huge light collecting area will allow us to observe some of the most exciting phenomena in the universe in much better detail." The E-ELT project is not quite ready to break ground yet, however. Construction cannot begin until provisional votes from four more of the ESO's 15 member states have been confirmed and 90 percent of the required funding has been secured, officials said. Building the E-ELT is expected to cost 1.083 billion euros, or roughly $1.35 billion at current exchange rates. ESO officials have said that construction is expected to begin sometime this year, with the telescope becoming operational in the early 2020s. Follow SPACE.com on Twitter @Spacedotcom . We're also on Facebook and Google+.